Toddler Video Player v1 published! Published my 2nd Android application on Market. Keywords "Toddler" or "Baby". Keep Playing Your Video Clips One-by-One with Minimal Interruption! A simple video player that plays local video clips continuously from your phone while disabling several standard ways of escaping or manipulating the video playbacks similar to Toddler Lock. Helps keeping your baby or toddler occupied for short moment. Playlist support is on the future enhancement list. Tips for setting up playlist even it is not supported yet. If you are computer savvy, create multiple subdirectories that contains only the video clips you want to be in the same playlist. Then using MENU->Settings to change the directory path to search the videos. It can act as a short-term trick before the full support comes out in future. Welcome any comments, feedbacks or bugs (hopefully not so much). Have you ever frustrated with your baby / toddler pressing random button to quit the video playback? Have you ever try to keep playing a list of video clips to your baby / toddler to keep them occupied? Now there is a new Android app that can lock most of the keys on the phone except HOME button and keep play the video clips in your Android phone. 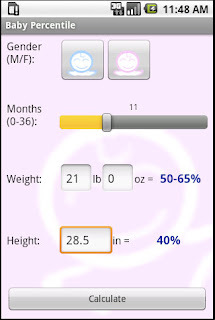 Updated Baby Percentile Android app to ver 1.0.1 fixing Droid font size issue. 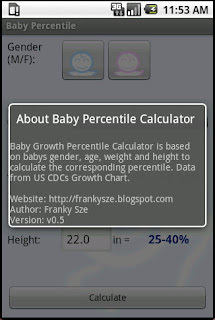 This is my first Android application - Baby Percentile Calculator. 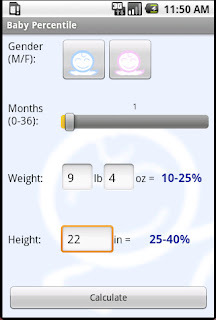 It takes baby's gender, age, weight and height to calculate its percentile. Data from US CDC's Growth Chart. Simple but useful application for first time parent like me. Each time we went to pediatrician for regular checkup. I always eager to find out my baby's percentile. Our pediatrician still use the pink chart to line up and match the percentile. I want to be more handy and thus created this app. If you appreciate and want to support my work, you are welcome to donate by clicking on the Google Checkout button on the right side. Enjoy! Any feedback is welcomed.